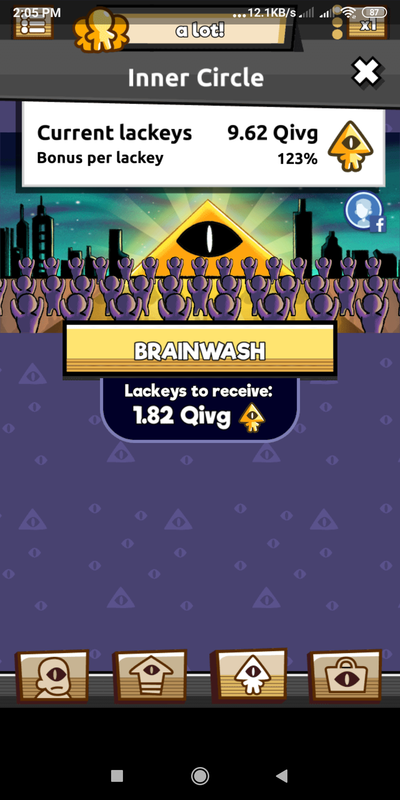 It says that I have 9.62 Qivg Current Lackeys and have 1.82 Qivg lackey if I "brainwash". How to improve those 2 numbers? I notice that the current number of current lackeys improve a lot. Ratio between lackeys to receive and current lackeys usually high. In my game, I've played for 2 days and the ratio is only .2. The ratio is usually around 1000 after 2 days playing. So I wonder how to improve that? I already bought everything. The game is pretty much finish for me. I just want to have a lot/s in one of the sources. Actually if anyone can tell me how the game really works it'll be great too. Browse other questions tagged android we-are-illuminati or ask your own question. How to get past level 30 on Teeter (Android)? How to get multitouch support in Bluestacks? What Does The White Number In The Blue Hexagon Mean? How to handle the crabs in Adventure Time - Time Tangle? How to backup Minion Rush?